Myddleton was briefed to manage broadsheet press coverage for an international bank in an employment dispute where a senior executive was dismissed after picking up £350,000 in cash in two suitcases from one of Africa’s wealthiest Kings and then taken an Uber taxi to deposit the cash at the bank. 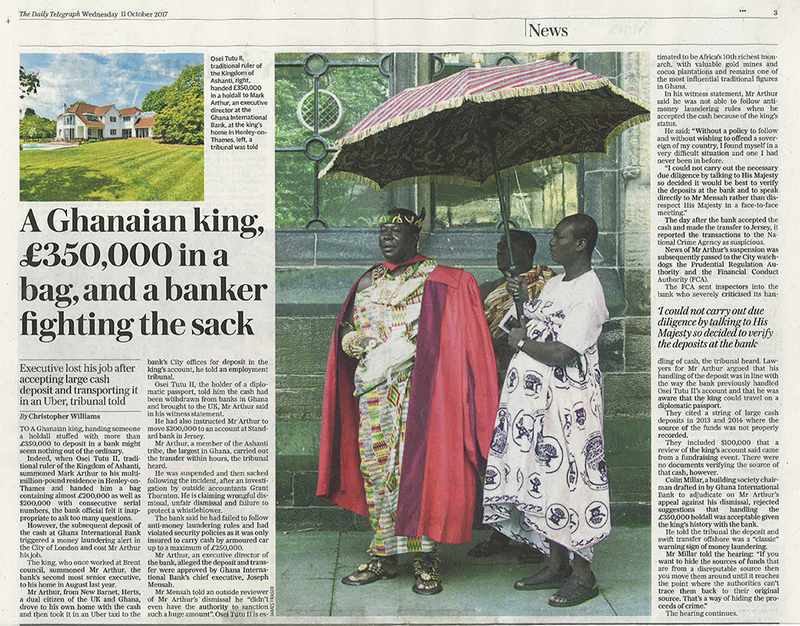 The executive said he was asked to visit the King at his mansion in Henley-Upon-Thames, where he was given two bags containing the cash is UK pounds and US dollars. He said he was so overawed by the King’s presence that he failed to count the money or perform the necessary due diligence, and instead did a spot check on the wads of notes. After taking the money, he first drove to his home and then ordered an Uber, rather than an armoured van, to take him to his office in the City. He then transferred some of the money to Jersey on the King’s instructions. His conduct in accepting the cash and subsequently not carrying out proper due diligence led to a money-laundering alert. He was suspended and then dismissed by the bank, but claimed wrongful and unfair dismissal, insisting the bank had approved his actions, and the King had always had special treatment as a client. As his legal team briefed the press with their version of events, Myddleton was brought in to manage press enquiries and brief The Times, The Daily Telegraph, Reuters and other key publications with the Bank’s version of events. Myddleton succeeded in shaping press coverage by attending court daily and conducting off the record interviews with the press, often at the court, so that the Bank was presented in a more favourable light. Managing press interest from West African media was particularly challenging, as there were misconceptions and misinterpretations of events that happened in London, and divisions in the press between those in support of the King and those against him. These were reported on-line, and on local radio and TV stations. By drafting clear on the record statements, and briefing journalists effectively Myddleton turned potentially negative press coverage into positive articles in the Bank’s favour. Judgment was handed down in January 2018 and found in the bank’s favour on both counts.